It’s the middle of November, at the very beginning of the first ever Dream Valley festival, and it’s hot. So hot, that nearly everyone in the 40,000-strong crowd packed into the sun-drenched Beto Carrero World amusement park is wearing the kind of clothes you’d expect to see at a Miami pool party in high summer. It’s freezing cold in the UK but, season-wise, it’s spring here in Brazil and the sun is going down on another gorgeous day as Green Valley (one of Santa Catarina’s top clubs) resident and Brazilian house DJ Rodrigo takes to the decks on the main stage to open the party. As he cues up his first tune – the Larse vocal mix of Candi Staton’s ‘Hallelujah Anyway’ – one of the organisers grabs him. “We’ve got to make sure the music doesn’t cut too far into the red,” warns the organiser. The tigers, you see, are the kind of real-live, roaring, man-eating beasts you might see on one of Richard Attenborough’s shows. And they’re running wild in the nature reserve attached to this huge theme park. The problem is, explains the organiser, if the tigers get disturbed, they might kick off and make their way into the theme park to let the scantily-clad, booze-happy festival folk know exactly how pissed off they are. And that’s why, he continues, a sound guy keeps popping over to the “zoo area” with a decibel meter; and to see if the tigers are okay. If Rodrigo is worried about the tigers, he doesn’t show it. Instead he launches into an uplifting, deep and Latin-infused set that ups the bpms as the sun goes down. Playing classics such as JD’s ‘Plastic Dreams’ alongside newer disco house cuts by the likes of Audiojack, it’s the perfect start to the first day of the first ever Dance Valley. 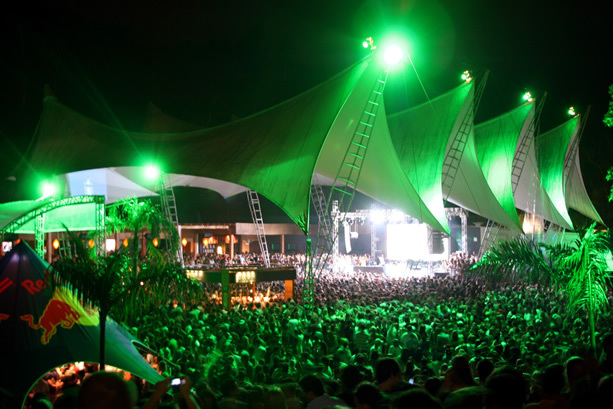 Hosting some of the world’s hottest DJ talent – including everyone from David Guetta, Hardwell and Hot Chip through to Sneak and Dixon – Dream Valley is a an exciting festival offshoot of Santa Catarina club Green Valley. What’s equally exciting, is that the line-up is also studded with a string of Brazilian DJs including Gui Boratto, Hot Creations act Digitaria and MYNC-collaborator Mario Fischetti. “Brazil is having a bit of a moment with electronic dance music,” says Flow, the female half of the Rio-based girlfriend-and-boyfriend house DJ/production duo Flow & Zeo. 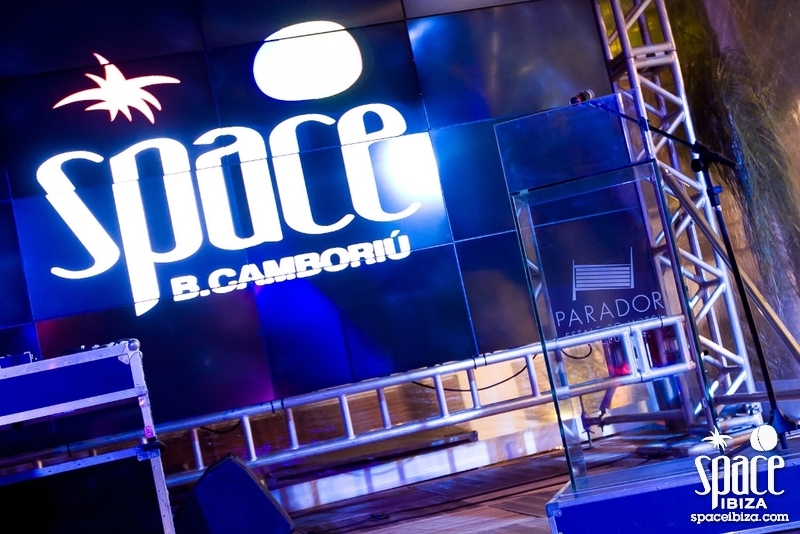 Marian ‘Flow’ Meirelles and Jose ‘Zeo’ Guinle (his dad owns the infamous Copacobana Palace hotel in Rio) have been a love-item for 12 years, and a house music DJ duo for nearly as long. More recently, they launched their own Tropical Beats label. They make their own tunes, too. And tonight, they say, they’ll almost definitely drop their new remix of X-Press 2’s ‘The Blast’. While Flow & Zeo take over the ‘Mystery Stage’, UK-based, Aussie twin-girl DJ duo Nervo are about to play in the main arena, called the ‘Dream Stage’. Calvin Harris is due on at 1.30am and he’s here already, backstage, knocking back Jaigermeisters with three friends he’s brought with him. “We’re going to be playing mostly banging electro house,” says Liv Nervo, one half of the twin-sister pair, who famously co-wrote David Guetta’s Grammy Award-winning single ‘When Love Takes Over’. “We’ll also play ‘The Way We See The World’ and a couple of newer things,” says the other Nervo twin, Mim. In action, they drop big room, electro house bangers including a fresh mix of Phats & Smalls’ ‘Turn Around’. Doing a one-on-one-off routine they rock it. Nervo play for a hi-octane 90 minutes and then, in what seems like a flash, Calvin Harris is on stage. He’s about to start his set when the now-muggy air is ripped open with a thunderclap. Then it starts pouring with the intense kind of tropical rain that’s heavy but warm. It’s wet, but no-one cares, as Calvin pogos around behind the decks dropping big room tunes such as ‘Reload’ by Sebastian Ingrosso & Tommy Trash. By the time day two kicks in there’s no sign of any more rain. On the Mystery stage, where Sneak and Dixon will play later, Hot Creations stars Digitaria are just starting their set as the sun goes down. The duo – made up of former love-couple Daniela Caldellas and Daniel Albinati – have come in from Belo Horizonte for their gig. Tonight, they assure DJmag, they’re doing a “half-live-half-DJ set” show. “We used to just play live,” says Daniela, as she and Daniel cue up their first tune. The pair – who previously released albums on labels including DJ Hell’s International DJ Gigolos and Bulldozer – open with a slice of instrumental, deep, electro-tinged house before Daniela picks up the mic and starts singing the lyrics to their own ‘You Bring Me Down’. Daniela’s voice has a Miss Kittin, electro quality to it, but with more melody. And Digitaria’s DJ/live set continues in a deep, melodic, cool electro house vane; with Daniela singing their own ‘Crazy Life’, a tune out now on Hot Creations, as part of the duo’s ‘Masochist EP’. On the main stage, meanwhile, things are gearing up for French duo Justice. The arena is ram-packed as they start their set, but a couple of tunes in and the crowd seems perplexed. Instead of dancing, arms-in-the-air style, like they did for Nervo, the crowd seems confused by the rock-tinged, electronic beats that Justice play. And when they weave a sample from T Rex’s ‘Get It On’ into a 4/4 beat the entire crowd seems to be standing still. By the time Guetta is ready to take the stage, after Justice, there’s a total roadblock across the festival ground. People are being told they can’t come in and out of the site for the next half an hour, until he starts his set. Dixon is about to play on the Mystery stage, but there’s no way to switch between the two and catch both play at once. Then, with an intro that would imply the advent of something celestial, Guetta arrives on stage. 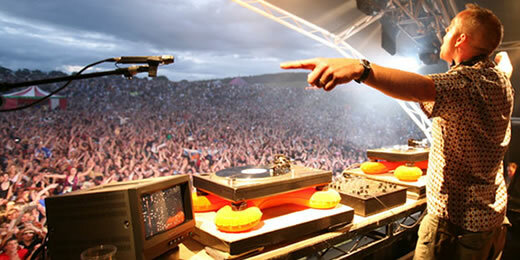 There must be at least 30,000 people crammed into the area in front of him as he opens his set. From the back of the arena, the sea of people is dotted with thousands of tiny, blue-lit mobile phone screens, all held up to film the skinny French DJ-popstar as he plays his first song. Like the modern day version of waving a lighter at a gig, screen-lights illuminate the crowd like thousands of electric blue fireflies. It’s breathtaking and, in that moment, it’s almost impossible not to be gripped by Guetta fever, even if the set he launches into is the usual pre-programmed, flawless blend of chart-hits such as Swedish House Mafia’s ‘Don’t You Worry Child’ and his own releases. Half way through his set and there’s a commotion on stage as Dutch big room DJ Hardwell, who’s due to play after Guetta, clambers up onto the decks. Guetta doesn’t seem bothered as the 20-something DJ starts clapping and dancing in front of the huge crowd. It’s that level of excitement that Hardwell then packs into his big room house set, that closes the festival. Luckily, as the last tunes play out, there’s still no sight of the tigers. And the only roars you can hear are from the 50,000-strong crowd. Since it opened in Santa Catarina last year it’s another world-class spot in the area – along with Warung and Green Valley. Brazil’s summer starts in December and lasts until April, making it the perfect place to head if you need a sun-kissed, beach-infused EDM fix during Europe’s long winter.